Emergency services arrived at the residence of an 80 year old lady that had taken a hard fall after her Apple Watch called for help. The device contacts emergency services in Haidhausen, Munich, after wearer took a heavy fall and failed to tap an option on the screen of the device confirming she was OK. A dispathcer accepted the emergency call from the device which informed him that a person had falled heavily, and then transmitted the coordinates of the scene of the accident. Additionally, the Watch also contacted the elderly lady's son as he was designated as an emergency contact. An ambulance was dispatched and arrived at the lady's home based on the coordinates given by the Watch. When they were unable to gain entry to the residence, a fire unit was dispatched and gained entry to the home. Thankfully, the lady was not injured despite taking the fall and the ambulance crew looked her over and waited with her for her son to arrive. 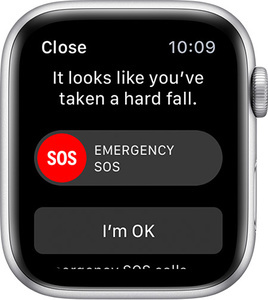 Apple Watch can detect a hard fall and will prompt a message on screen giving the user the option to respond "I'm OK", or to tap "EMERGENCY SOS" to contact authorities. For over 65s, the feature is automatically enabled. If a person fails to respond to the watch after a fall, it will contact authorities and other designated contacts.